I remember the first time I fell in love. It was a hot Texas summer day just like every other hot Texas summer day. Except on this particular day, I saw something out of the corner of my eye that changed everything. I caught a glimpse of a C-stripe: black on red. I had to see more. When we turned around I saw the fastback roofline, then the GT emblem on the front fender, then the front end, and finally the small red ‘for sale’ sign in the windshield. It wasn’t long until she was home with the family. It was inevitable to get swept away with a gear-head for a father and a muscle car in the driveway. I learned everything I could and we went to as many car shows as possible. After 15 years of interest, I have finally compiled my favorite Mustangs into one lustful list. Enjoy! The car that started it all! The original pony car, which was officially unveiled by Henry Ford II at the World’s Fair in Flushing Meadows, New York, on April 17, 1964, took America by storm. This debut model was honored as being the Official Indianapolis 500 Pace Car. With over 400,000 Mustangs sold in its debut year, it’s no wonder this little pony made the list. 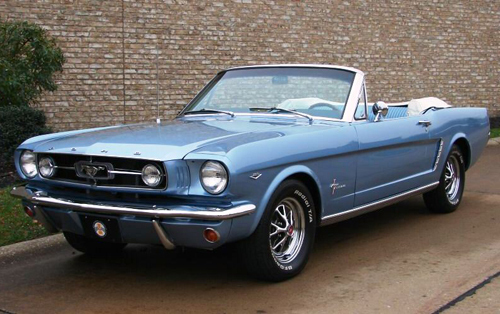 The 1965 Mustang convertible is undoubtedly classic Americana. The ’65 line-up included the coupe, convertible, and all new fastback. New options included the GT package, the pony interior, and the option for AC. 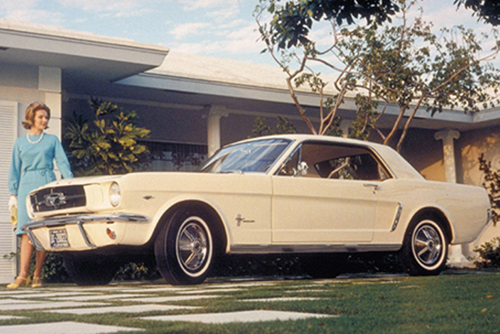 The 1965 Mustang even won the Tiffany Gold Medal for excellence in American design, the first automobile ever to do so. With so many new amazing options it was hard to pick just one to represent the year. 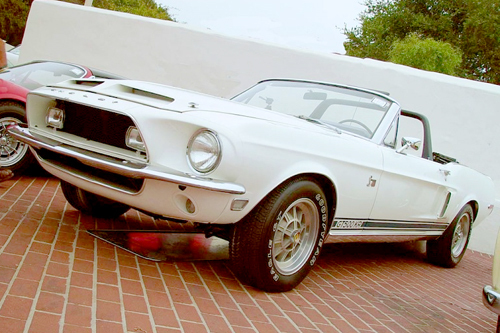 In September of 1965, Shelby American General Manager Peyton Cramer struck up a deal with Hertz to offer the 1966 GT350H Mustang as a rental car. For about $17 a day you could rent a Mustang with a Cobra 289 HP engine boasting 306 hp and 329 lb-ft of torque. Sure beats the rentals of today. While the redesign started in 1967, it was refined in 1968 with different detailing while maintaining the new, larger size. The 289 V8 engine option was now behind the newer 320 hp 390 cu in (6.4 L) FE engine. The ’68 GT Fastback is perfect for its body lines to its engine options to its accessory options. Maybe it’s because this model is my first love but I personally don’t think it gets much better than this! If you’d like to see this car in action then you should definitely watch the movie, Bullitt. The Mach 1 was a V8 powered Sportsroof body with numerous visual and performance enhancing items. There was a matte black hood treatment with hood pins and hood scoop (including optional Shaker scoop), deluxe interior, and an unmistakable dealer optional chin spoiler just to name a few appearance features. Mach 1’s featured competition suspension and a variety of powertrain options. My favorite feature for the ’70 Mustang is a simple one: the Grabber Blue paint. There’s nothing else quite like it! The Boss 302 Mustang, designed by Larry Shinoda, was Ford’s answer to the Chevrolet Camaro’s daunting presence. According to Car and Driver in June 1969, “The Boss 302 is a hell of an enthusiast’s car. It’s what the Shelby GT 350s and 500s should have been but weren’t.” For ’69 the Boss 302 was limited to four exterior colors including Bright Yellow, Calypso Coral, Acapulco Blue, and Wimbledon White. Bright Yellow and Calypso Coral were unique to the Boss 302 in 1969. 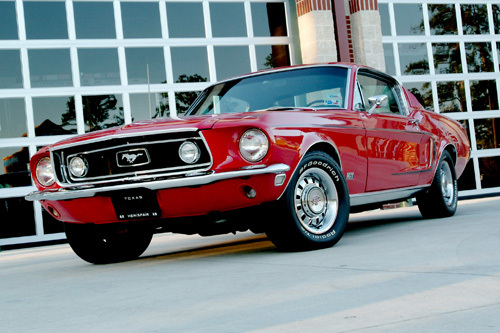 In late 1969, Ford offered a special-edition Mustang to dealers in the Kansas City area. These 1970 Mach 1-based cars were named “Twister Special.” These Mustangs featured either a 428 Super Cobra Jet engine or, due to a 428 shortage, a 351 Cleveland. Buyers had the option of selecting either a manual or automatic transmission. Only 96 of these Grabber Orange Mustangs were ever produced. The 1968 Shelby GT500 KR rightfully earned the name “King of the Road” with it’s 428 Cobra Jet engine and restyled fiberglass front end. The 7.0 liter V-8 put out about 400 horsepower and 440 pound-feet of torque at 5,600 rpm. Exterior details that made the GT500 KR stand out were twin hood scoops and louvers and included “Cobra Jet 428” emblems on the fenders, dash and gas cap lid, and graphics on the front fenders. 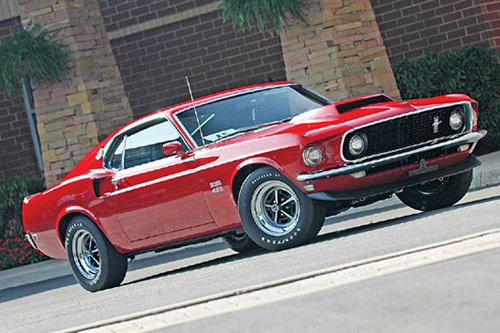 In 1969 there were only 859 Boss 429s made by Ford Motor Company. The engine was originally designed for NASCAR racing and was crammed into the ’69 by Kar Kraft to meet sales guidelines. The Boss 429 has a toned down exterior with minimal badges and the hood is crowned by a massive scoop. The combination of beauty and brawn has earned this model the number one spot on my list. Shelby’s one-off experiment Mustang never made it to production. Read all about the Shelby EXP 500 at blog.hemmings.com. 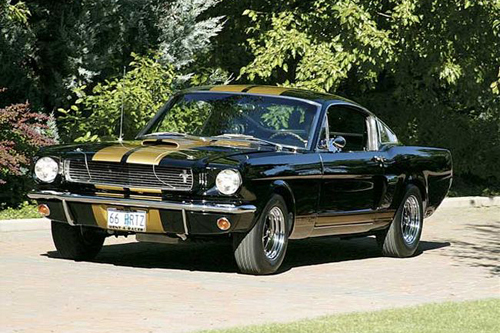 Awarded to the 1964 Playmate of the Year, this Mustang was a special order. Is there something I missed? What is your favorite classic Mustang? Please comment below! This list article example was written as part of a portfolio for Jodi L. Robbins. If you are interested in guests posts or using this content on your site, use the contact form link at the top of the page to submit your request.